Nearly everyone on Michael Finuoli's flight from Los Angeles to Philadelphia was singing the Eagles' fight song Wednesday when his plane touched down at Philadelphia International Airport, jumpstarting the pre-party for the Eagles Super Bowl Parade today. Just one week prior, Finuoli had what he called an "incredible encounter" with one of his childhood idols. 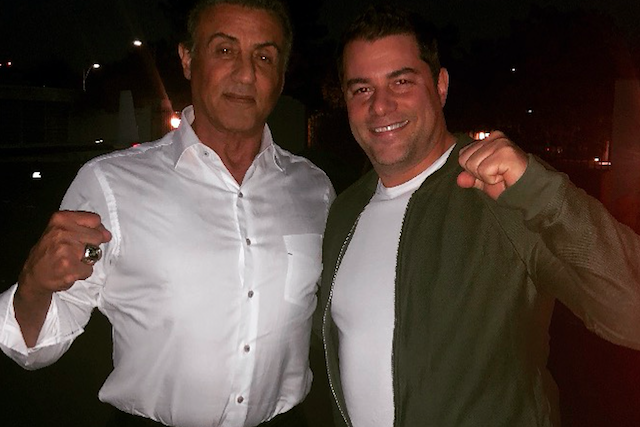 A friend of his in the movie business introduced him to Sylvester Stallone, and when Finuoli shook Sly's hand, he said he could feel the confidence Stallone had in Philly's Eagles with that handshake. "He told me. He guaranteed that we were going to win," said Finuoli. "I felt so good about it that I booked this flight knowing that this moment was going to happen – and it did – and now I'm here." Originally from Bensalem, Finuoli has lived in Los Angeles for the last 20 years, but booked his flight back home prior to the Eagles' Super Bowl win on a whim, a hunch, and a prayer that the Birds would bring home the Lombardi trophy. But then again, maybe it was that Stallone handshake. "I'm a lifelong Eagles fan, so this moment in history, I just could not miss. I already knew we were going to win. "I heard a rumor he'll be running up the [Rocky] steps."